Greek Moussaka is often rib-sticking fare but with this low fat makeover its a mid-week meal you can enjoy without watching the scales. This low fat moussaka recipe is still brilliant for anyone trying to trim down at the same time as serving up their family a hearty, filling dinner. The dish works on a series of healthy swaps. Traditionally moussaka has layers and layers of potato and béchamel sauce. To make this a leaner version of the classic, I’ve saved the potatoes until the top of the dish and replaced the extremely buttery and indulgent béchamel sauce with a topping of yogurt, cottage cheese and egg. It still has the creamy texture that we all crave but it won’t add pounds to your waistline like the original. I’ve also made the original moussaka recipe leaner by replacing lamb mince with lentils – an added bonus is that it’s also perfect for anyone doing Meatless Monday’s! What I also love about this dish is it is incredibly easy. It creates minimal mess – just a chopping board, pan and oven dish – and with the 45 minute cooking time you can clean away any mess you have made during the prep, just leaving the oven dish and your plates! 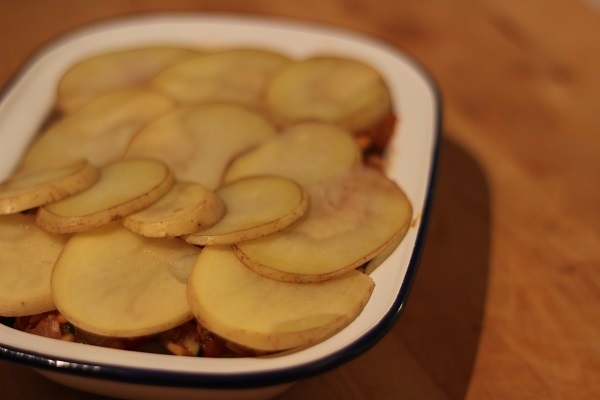 This low fat moussaka has allthe flavour but less of the fat of the classic Greek recipe. Begin by cooking the onion (chopped) and garlic (crushed) in little olive oil until translucent. Bring the sauce to the boil and then simmer for 10-15mins or until the sauce thickens. Add in the mince and cook for a further five mins until browned before adding mushrooms, tomatoes, stock and herbs. Slice the aubergine into slices no more than 0.5cm thick. Pour the lentil sauce into an ovenproof dish and then layer with the aubergine. Repeat this process until all of the aubergine and sauce has been used up. To finish off the dish, slice the potatoes thinly (again no more than 0.5cm thick). Place the potatoes on top to form the final layer and then mix the yogurt, egg and cottage cheese together to form the gooey top. As my OH is vegetarian I often swap the lamb mince for a heaped cup of red lentils. Of course quorn mince or simillar meat free mince works well too. If you can’t get hold of aubergine don’t be tempted to go back to using potato in between each layer of sauce. Instead opt for courgette. You’ll need more slices as they are smaller than aubergines but you won’t compromise on taste or calories. If you find topping is cooking too quickly (which can happen in electric ovens which are heated from the top) cover the dish with tin foil and only take it off in the last 5 mins. It also helps that I know it’s going to put a big smile on my partner’s face when he comes home from work. 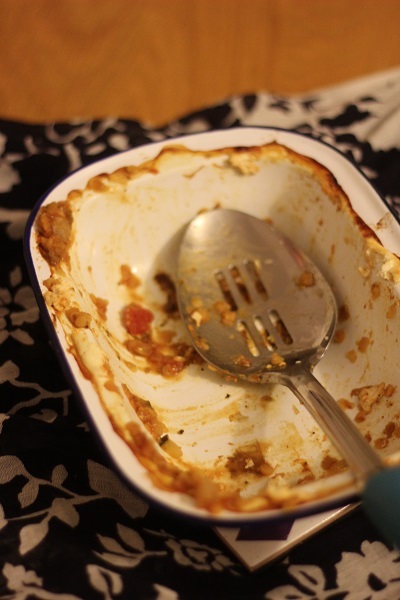 This skinny moussaka is yet to disappoint! I can’t guarantee its authenticity but we love it. Hopefully I’ve achieved a tasty dish with a lot less calories. He may well be critical – noone cooks Greek food like his Mum – but he does need to lose some weight!